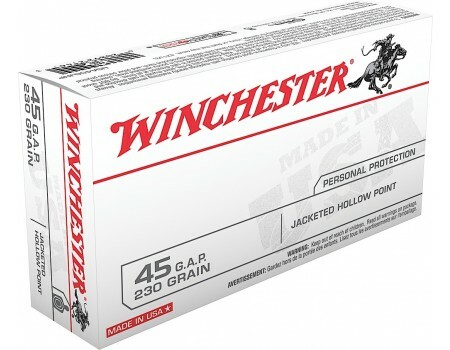 Winchester USA Handgun Ammo for Personal Protection/Target. 45 GAP, 230 GR, Jacket Hollow Point. Box price, 50 Rounds/Box. This USA centerfire rifle ammo is the ideal choice for personal protection. This sure functioning ammo has a jacketed hollow point bullet with an optimum high energy deposit, consistent accuracy, and controlled recoil.